The range of the human field of vision is limited to approximately 150 degrees, which means that our eyes can perceive only a small fraction of an entire scene we are seeing. Photo cameras are similar to a human eye in many ways, but unlike our organ of sight, cameras can capture a horizontally elongated view or a so-called panoramic photo. Almost any digital camera you can find can be used to create a panoramic shot, but DSLR cameras that have a Manual mode are probably the best choice you can make if you want to get the best results. In this tutorial, we are going to take you on a panorama photography journey and we are going to show you how to make this type of photo effortlessly. Part 1: How to shoot a panorama? Outdoor or landscape photography has many niches, and panoramic images are probably among the most popular types of outdoor images. If you want to create a great panoramic photo, you can't just point and shoot, since equipment and planning of a shot play a large role in how good a photo will be. Using a DSLR camera that lets you use more than just one lens or control settings manually is a better choice for aspiring panorama photographers since panoramas captured on Smartphones simply lack the picture quality. Furthermore, a tripod or panoramic robot head are essential parts of any panorama photo equipment setup because they allow you to take pictures that are perfectly lined up with the horizon. The fact that you have to combine a number of images into a single shot in order to create a panorama photo, puts a lot of pressure on a photographer to produce nearly identical images of the scene. For that reason, most people shoot panorama pictures in Manual mode, that lets them adjust the camera's settings to each scene. Finding the right exposure and aperture values for an entire scene you want to capture is essential because a photographer must make sure that these values are the same in every photo that is going to be used in a panorama photo. The depth of field of panoramic images has to be large because the objects you want to keep in focus can sometimes be far away from a camera. F values need to be roughly around f/16 or f/22 if you would like to have a perfectly sharp panoramic view of a scene you photographed. The exposure value or white balance depending on the part of the day and the amount of light available on the scene. Keeping your camera stable is vital for creating a good panorama picture because handheld versions of panoramic images often result in distorted images. A tripod that has a built-in bubble level and a head that can be easily rotated will enable you to easily move the camera and capture every detail of the scene. Experienced photographers often use tools like robotic panoramic heads that automatically create trajectories for taking panoramic photos. However, this investment may be expensive for someone who doesn't want to take these types of photos on a daily basis. The orientation of the picture is determined by the camera's orientation in each shot. Although it may sound reasonable that the landscape orientation is more appropriate for a panoramic image, the opposite is true. Using horizontally oriented photos to create a panorama image can result in a narrow picture, while the images shot in Portrait mode provide more height to panoramic photos. Choosing to shoot in the Portrait mode will require you to position your camera vertically, which can be easily accomplished on any semi-professional tripod. The sheer amount of images needed to create a panorama photo can be huge sometimes, and for that reason, you can save space on your SD card by choosing to shoot JPEG files that are considerably smaller from RAW camera files. 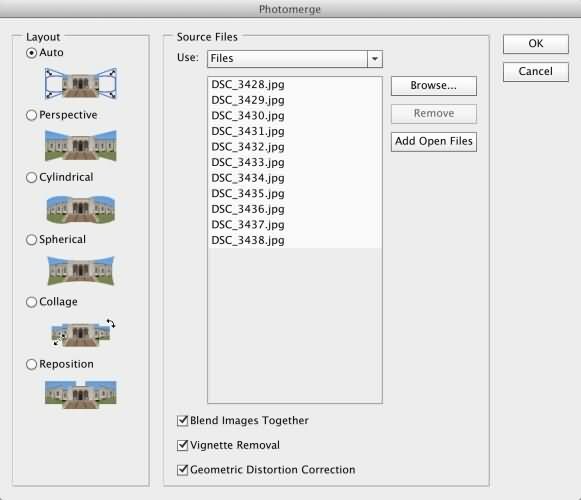 The software you use to patch together a panorama shoot will produce a high-resolution picture if you use the largest JPEG size your photo camera is capable of producing. If you have a lot of memory space and you want to go through the process of editing each RAW file before you can use to create a panorama, you can shoot RAW files, but JPEG files are easier to access and don't require you to change the file format so just you can use them. 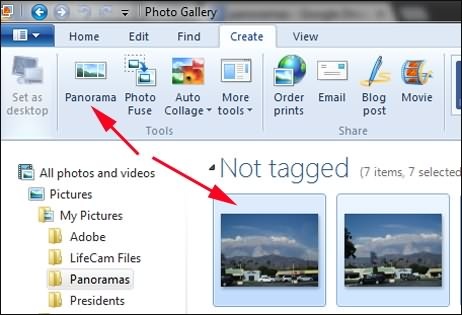 If you've managed to capture footage that can be used for the production of a panorama photo, but you still don't know how to use the professional photo editing software, the Windows' Photo Gallery will allow you to path your photos easily. Launch the app and import the photos you want to use in your panorama, and then head over to the Create tab. Click on the Panorama option and just wait for the program to patch all the photos you selected. The results you'll be able to accomplish with Photo Gallery will not be glorious, but this photo viewing app will at least allow you to produce a panorama quickly, even though you will probably have to edit it further to get a more balanced panoramic picture. Opting to choose Photoshop to produce a panorama photo is hardly a bad choice, although its panorama-making abilities may not be as powerful as it could be expected. To start the process, you must first click on the File menu and select the Automate option. Click on the Photomerge option in the Automate drop-down menu and wait for the new window to pop-up. The Photomerge window will enable you to pick the type of layout you want to use for your panorama photo, import the photos or even perform a geometric distortion correction. After the software merges your photos, you can use other Photoshop's tools to crop your panorama photo or enhance its colors. If you are looking for more photo editing software for stitching photos, you can get some information at Best Photo Stitching Software to Create Stunning Panorama Photos.